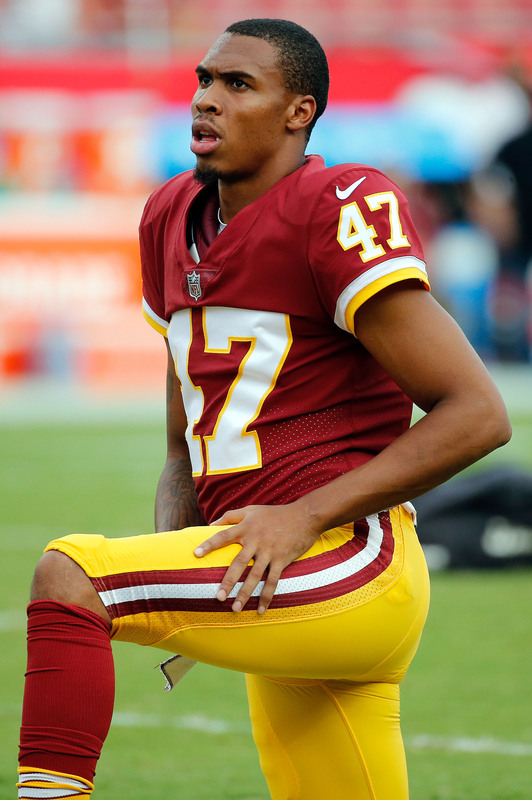 The Redskins have placed cornerback Quinton Dunbar and wide receiver Trey Quinn on injured reserve, the club announced today. In addition, Washington announced it has signed center Demetrius Rhaney, and also confirmed the previously-reported signings of quarterback Josh Johnson, guard Zac Kerin, and defensive end Marcus Smith. Dunbar missed Weeks 10 and 11 while dealing with a nerve issue in his shin, and struggled when he returned to the lineup in Week 12. He sat out again this past Monday night, and the Redskins have decided to call it a season for the 26-year-old defensive back. A first-time starter in 2018, Dunbar graded as the league’s No. 46 corner among 113 qualifiers, per Pro Football Focus. Football Outsiders, meanwhile, ranked Dunbar 33rd among 69 cornerbacks in yards per pass allowed, but just 54th in success rate, meaning he wasn’t effective at stopping receivers short of the sticks. Washington and Dunbar agreed to a three-year, $10.5MM contract in January that superseded his status as a restricted free agent. He should return to the nation’s capital in 2020 at a base salary of $3MM, although the Redskins could save $2.25MM by releasing him. In the near term, Washington will turn to Fabian Moreau and Greg Stroman at cornerback behind No. 1 option Josh Norman. The Redskins activated wide receiver Trey Quinn off injured reserve on Wednesday, per a club announcement. The club has now used both of it’s IR-DTR opportunities after designating running back Byron Marshall for return earlier this year. Quinn suffered an ankle injury in Week 1 after being selected in the seventh round of this year’s draft. The Redskins’ WR unit has been banged up this year, including the unfortunate loss of Paul Richardson, so Quinn could wind up seeing some snaps in the second half of the year. Quinn had two catches for 12 yards before he was forced out of the Redskins’ season-opener against the Cardinals. After he caught 114 passes for 1,236 yards and 13 touchdowns at SMU in 2017, the Redskins are extremely eager to see what he can do. Quinn’s first action since September could come on Sunday against the Texans. With a win, the Redskins can maintain or improve their divisional lead over the Cowboys and Eagles. Redskins Not Interested In Dez Bryant? Twenty-eight NFL teams are now heading into Week 2. Dez Bryant remains unemployed. However, the wide receiver’s made sure to keep social media followers informed on his thoughts about potential fits this offseason and continued to do so Sunday. One of the teams Bryant name-dropped, however, doesn’t appear to have him on its radar. The Redskins are not interested in bringing in Bryant, despite having multiple depth receivers suffer recent injuries, JP Finlay of NBC Sports Washington tweets. This is not the first time Washington’s surfaced as a confirmed non-Bryant suitor, but that hasn’t changed since the offseason. Washington’s dealing with injuries to backups Trey Quinn, Cam Sims and Maurice Harris, per Finlay, who instead foresees a possible reunion with Brian Quick rather than anything transpiring on the Bryant front. Quinn, a rookie seventh-rounder, and Sims each suffered high ankle sprains during the Redskins’ win over the Cardinals and are out for the foreseeable future. A concussion left Harris inactive Sunday. These three comprise the Redskins’ backup contingent behind Jamison Crowder, Josh Doctson and Paul Richardson. So, Washington will certainly have to make a move at receiver this week. Bryant expressed interest in joining an NFC East team in order to exact revenge on the Cowboys, whose post-Bryant receiving passing game did not debut well on Sunday, but he’s also turned down two contracts — from the Ravens and Browns. The 29-year-old pass-catcher continues to wait, while at the same time expressing interest in certain situations.